A New Jersey man who won a $338 million Powerball jackpot, among the largest lottery winnings, is embroiled in a court fight with his former girlfriend over the money. 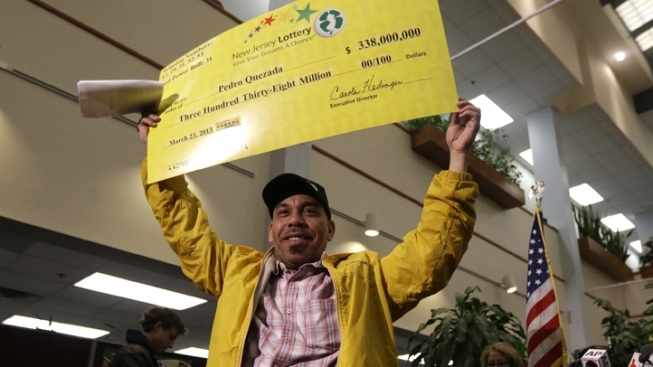 Pedro Quezada of Passaic was the sole winner of the Powerball drawing last spring, worth about $152 million after taxes. His lawyer argues that Inez Sanchez has no claim to the money because the couple were never married. But attorneys for Sanchez say Quezada purchased the ticket based on the couple's shared earnings. Sanchez and Quezada lived together for 10 years, have a child together, and shared ownership of a grocery store in Passaic, attorneys say. Superior Court Chancery Judge Margaret Mary McVeigh refused to dismiss the lawsuit and she denied a request from Sanchez to freeze Quezada's lottery winnings, pending the outcome of a trial to determine if she is entitled to a share of the money, The Record reported Saturday. The judge said Friday that while the couple's relationship was long-term and Sanchez contributed to the household, the court has no legal framework for restraining Quezada's assets. Sanchez has moved out of the recently purchased Clifton home the couple shared and has filed a domestic violence claim against Quezada, The Record reported. Quezada's attorney declined to comment on that claim. Sanchez's attorney says that a large chunk of the lottery winnings is already gone, claiming $57 million has been sent to Quezada's native Dominican Republic, $5 million was given away, $300,000 was spent on the home in Clifton, and $20 million can't be located, the newspaper reported.